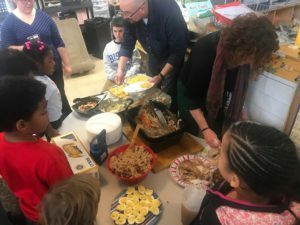 On the Tuesday before Thanksgiving, students, parents and teachers worked together to prepare, serve and eat a feast. When asked what she was thankful for, one of our third graders replied “thank you for this school and everyone in it because I know that everyone cares about me”. It doesn’t get much better than that!